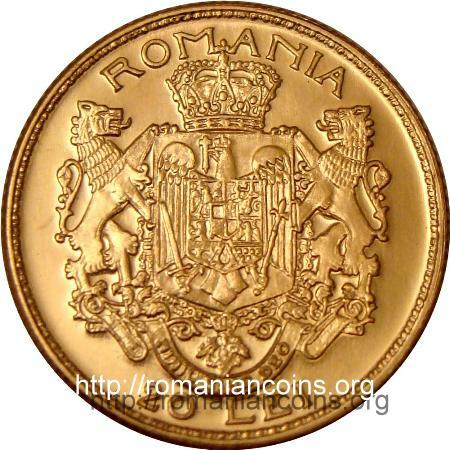 denomination 20 LEI, ROMANIA and middle coat of arms of the Kingdom of Romania, outer pearl circle effigy of the king crowned with a laurel wreath, facing left (or right in heraldic perspective), year 1922 and inscription "FERDINAND I REGELE ROMANILOR" meaning "FERDINAND I KING OF ROMANIANS", outer pearl circle. Under the effigy's neck lies inscription P. M. DAMMANN, the engraver's name. At the left of the neck lies R from replica. 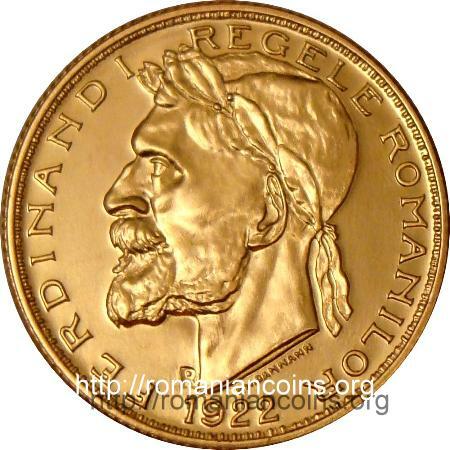 The replica of the anniversary 20 lei gold coin from 1922 was struck in 2008, with the occasion of the 90th anniversary of the Great Union of 1918. The genuine 20 lei 1922 coin can be seen here.